Chrissie's mithered about the wedding; she's particularly concerned about Paul seeing the dress before the big day. Melanie assures her that everything will be fine. A jocular Jim reminds Paul of his marital history. 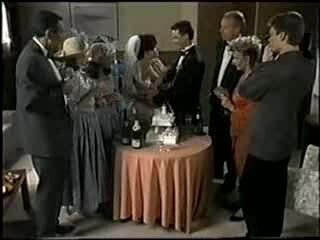 Morerover, he claims that no Ramsay Street wedding ever goes smoothly. Paul says this wedding's going to break that tradition. The focus of the scene is the importance of tradition to Margaret. She's glad they've decided on a church wedding, but laments that they won't be leaving from No.22 in a bridal car. Her main concern is that Chrissie wears her great-grandmother's wedding dress. The twins have the awkward task of telling their mother that Chrissie is in fact wearing the new dress she has chosen. They act entirely to character. Chrissie's tongue-tied and skittish; Caroline, a little less so, tells it how it is. In the end Margaret gives her blessing. Melanie bursts in with a bottle of champagne. She rather impatiently informs the girls that she has remembered everything including Chrissie's blue garter. She makes the telling remark that the wedding dress -obviously the old, and, therefore "wrong" one- was difficult to iron. In stark contrast to the frenetic goings on at No.22, Paul and Jim are lounging in very 1991 tracksuits, feet on table, in the front room. Jim, half-wistfully, half-jokingly, asks Paul whether he's sure that he's doing the right thing. Paul's adamant that he wouldn't be doing it if he wasn't. 'Third time lucky it is then,' Jim says. At this moment Helen comes through from the kitchen, still in her dressing-gown, rollers in her hair. She tells them that Madge managed to finish the wedding cake, before setting off on holiday with Harold. Paul tells his gran what Jim has been saying.Paul: Too right it is! JIM: All I said was that Ramsay Street weddings never go off smoothly. HELEN: This one is going to be different. PAUL: Too right it is! The bridal party pull up at Margaret's. Melanie, never speaking truer words, says how big the house is and revels in the idyllic setting. Margaret is squabbling with the bride about sea-sickness tablets; Chrissie assures her mother that she's a good sailor. Inside, Melanie reminisces about meeting Roger on a cruise. Everything seems to be going smoothly. The bouquets are present. The champagne's cracked. Melanie's face drops when she realises that she has brought -what she thinks to be- the wrong wedding dress. She hides the new wedding dress under a chair, makes her excuses and leaves awkwardly. The Alessis are nonplussed. 'And that girl reckons she's not scatterbrained,' Margaret remarks, as the girls giggle and cuddle. The action takes place in the kitchen. Throughout the scene Jim is messing about with a cumbersome, oversized video camera. Helen is fiddling with Paul's bow-tie. All three are keen that the wedding is recorded for posterity. Helen feels that still shots will suffice; Paul and Jim disagree. Helen refuses to do the filming so Jim vows to enlist Adam for the job. Mel pulls up outside No.22 in a taxi. Seeing the Robinsons haven't yet left she tells the driver not to wait. As Mel goes inside, Paul, Jim and Helen rather predictably leave. Mel finds the dress on the work-surface, but disaster strikes as she hears the car starting up. She rushes outside, but, alas, the car's already at the bottom of the street. Bewildered, she scuttles back inside and starts ringing taxi firms. She has little joy. The best advice she receives is to hail a car on the street. Off she trots, nearly forgetting the dress! Caroline tells the flustered Chrissie and Margaret not to worry: she's got a contingency plan. As she rushes upstairs the camera pans to the wedding dress, which is under the chair where Melanie hid it. Paul and Jim are chatting with the vicar. He's checking that Paul wants the modern version of the service -women don't like being told to "obey" these days. The vicar expresses concern that this isn't Paul's first wedding, yet he looks so young. Paul blames bad luck! He does look a little concerned though. Caroline's contingency plan is her Cinderella costume from school. Helen, who has by this time arrived, pragmatically agrees with Caroline that the dress is very pretty. Margaret isn't happy: the dress doesn't compare to the twins' great-grandmother's. Chrissie is distraught. 'I'm not getting married dressed as Cinderella,' she bleats. As Caroline bends down she finds the "right" wedding dress under the chair. There's much relief all round as Chrissie rushes upstairs to get changed. CAROLINE: Hang on a minute, if the dress is here, where's Caroline? 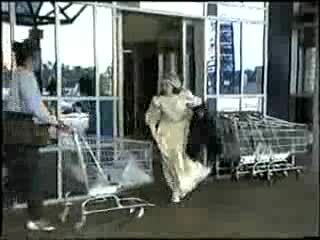 Melanie rushes down an escalator, now wearing the wedding dress. Her attire enables her to jump the taxi queue. She dives into the cab and the driver speeds off. Jim's showing Adam how the video recorder works. Paul comes over, visibly flustered, fearing that Chrissie has had second thoughts. Frank attempts to calm his nerves. Paul isn't convinced by his tale of Margaret being late on their wedding day as well. Helen comes over to explain what has happened. Paul knowingly nods his head and rolls his eyes. He asserts that there isn't time to wait for Melanie. An opinion confirmed by Margaret who trots up to inform them that they have decided no to wait for that 'silly girl'. Helen wishes Paul luck as he and Jim head for the church. Paul doesn't look amused as Adam wafts the video-camera in his face. Mel pulls up outside the house. It immediately dawns on her that the bridal party has already left; her face drops when she hears the organ playing. She rushes up the hill to the church, tripping as she goes. The camera predominantly focuses on Helen and Margaret, both of whom are visibly nervous. In rushes Melanie; everyone assumes the bride has arrived! Helen and Adam smile and chuckle. After that hilarious dummy-run, it's time for the real bride. Frank leads Chrissie down the aisle. She looks beautiful as she's trailed by her two bridesmaids. (Melanie has seemingly got changed quickly!) Paul and Chrissie exchange their vows. It's all very lovely. Chrissie looks overjoyed as she gives Paul a good snog. A tear trickles down Helen's cheek. The guests are assembled. Melanie is telling Caroline and Helen how guilty she feels about everything. They tell her not to worry. Caroline says she should have been better formed. Moreover, as Helen adds, it all ended well. Paul and Chrissie move either side of Mel. 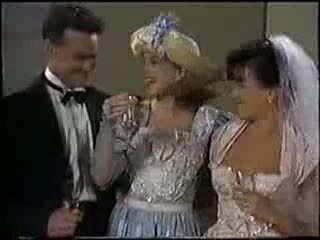 She proposes a toast to them. The main guests are around the cake as Paul goes to cut it. 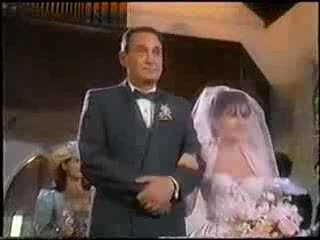 Melanie begs Paul not to separate the little bride and groom. Paul tells her not to worry as there will be no separations in this marriage! Melanie and Caroline plonk down on a settee. Melanie laments that this could have been her wedding. Caroline shakes her head as Melanie is getting visibly light-headed. The girls go off for a walk in an attempt to stop Mel being sick. 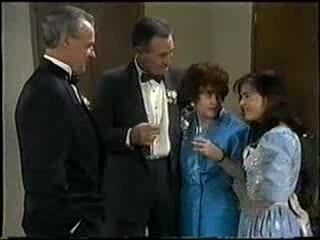 Frank, Margaret, Jim and Helen are making small-talk. Caroline comes over. When Jim and Caroline are alone, he tells her how lovely she looks. By this time the reception is drawing to a close; the guests are beginning to depart. Helen asks where Melanie is. Caroline tells her that she asked someone to put her in a taxi and send her home. Chrissie thanks everyone for coming; Paul thanks them for the presents! Chrissie throws the bouquet; Caroline catches it. Frank says it wasn't fair: Melanie didn't get a chance and he has no intention of losing another daughter so soon. Paul and Chrissie kiss.